Monaco, also officially known as the Principality of Monaco, is a country on the French Riviera in Western Europe bordered by France. Whether traveling for a luxury vacation, business, or special event, our Monaco jet charter brokers can arrange a private flight to/from anywhere in Monaco and neighboring countries in Europe. Travel to Europe using our Monaco private jet charter service. Private flights to cities such as Monte-Carlo and La Condamine are requested frequently by Jet Charter Europe clientele. The ideal months to visit Monte-Carlo, Monaco’s top tourist destination, is during Spring (May) and Fall (September-October) months, when the weather is more relaxing for an enjoyable experience. Arrive in style via private jet when traveling to Monte-Carlo. Monte-Carlo provides luxury four to five star hotel options around the city. The below list of hotels are based on Jet Charter Europe clientele feedback, location, amenities, and online reviews. Our Monte-Carlo charter service brokers can also arrange ground transportation to/from the hotel of your choice. Seven hectares in size, this beautiful garden features hills, a waterfall, a beach, a Zen garden, and other Japanese influences. It’s a great place to take a break from some of the more busy parts of Monaco, and find some tranquillity. This is a true tourist spot, and it’s clear when you get there. Photo ops, shops and cafes, and a couple places to sit down and enjoy the architecture and scenery. 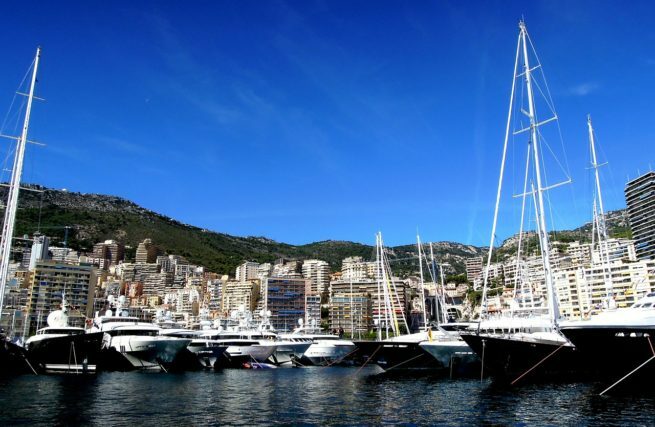 The harbor is the perfect place to see all the yachts and boats that set out to sea in Monaco. Nearby there are plenty of places to grab a bite to eat, and is close to the Casino. Place du Palais is a great place to visit whilst in Monte-Carlo, Monaco. It is filled with history (much of which can be learned on one of the many tours), family-friendly restaurants, many statues, and souvenir shops. It’s a large tourist attraction, but is very important to the city. The Larvotto Beach may be a bit small, but is definitely beach central in Monaco. It has mixed reviews, but overall seems like a calm atmosphere and environment to spend some time in the sun. Request a Quote or give us a call at 1-888-987-5387 to speak with one of our Monaco private jet charter service brokers for your next luxury vacation, business trip, or special event in Monte-Carlo or any destination within Monaco.